Home Lifestyle & Another Thing... “There’s Gold in Them There Creeks” Panning for Gold can be fun and rewarding! The creek in my backyard overflowed during a storm, and surging water dislodged hidden minerals that settled in exposed outcroppings and shallows. The next morning, sunlight glistened off tiny gold colored specks and flakes, many no bigger than a pinhead. Could it be gold? Or maybe it was iron pyrite, better known as fool’s gold. I shoveled a few scoops of muddy water containing specks into my miner’s pan. Although I haven’t completed my analysis, I thought I would share a few tips about gold panning in case you want to try it yourself. All you need is an inexpensive miner’s pan and a hand shovel. Just be sure you have permission to pan the river or creek. The law says that whoever owns the land owns the gold. First, a few words of encouragement. Experts believe only 5% of the gold in North Carolina has been found. Much undiscovered gold remains in rivers and creeks, so prospecting odds are good. There are two kinds of gold deposits: lode and placer. Placer gold is the gold you pan for in water. 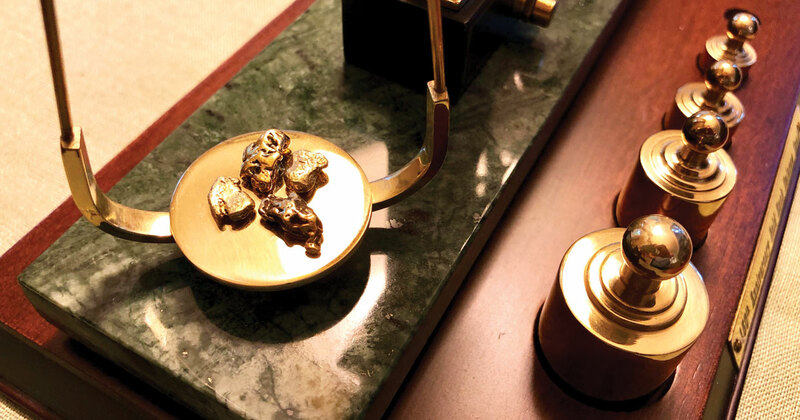 Placer gold begins when a lode deposit erodes by weather, leaving heavier minerals like gold. That gold is often transported down rivers or creeks. Prospectors find placer gold behind large boulders, in deep bedrock cracks, inside bends, and in other low spots where gold settles. The following advice on gold panning was provided in information circular #29 published by the North Carolina Department of Environment, Health, and Natural Resources. 1. Fill the pan with stream material about level with the top of the pan and submerge it in the water. Massage the material with your hands to break up clay and remove debris like sticks and rocks. Slow flowing water about one half to one foot deep is best. 2. With the pan under water hold its sides and twist the pan back and forth briskly to work the gold and heavy minerals to the bottom of your pan. During this stage, large and lightweight materials will migrate to the top, and you can dispose of them. 3. Continue to work the gold to the bottom of your pan and, as you do, lighter particles will wash over the top of the pan. Raise your pan just above the water and tilt the pan forward away from yourself. As the pan is raised particles in the top will wash over the side. Alternate between steps 2 and 3, occasionally removing large particles that rise to the surface. 4. Over time, finer sand will wash away from darker, heavier minerals. The final concentrate will be mostly dark, heavy minerals, and gold, if you are lucky. Collect the heavy mineral concentrates in a jar or bucket for processing later. Minerals are separated by slowly rotating the pan while swirling water around the bottom of the pan. Gold will remain near the rear of the trail of minerals. 5. Gold can be removed from the “heavies” by removing magnetic material with a magnet. When the sand is dried, it may be separated from the gold by gently blowing and then picking out the gold with tweezers. If you don’t have access to a creek or river, consider visiting a North Carolina tourist attraction where you can practice panning skills as you search for gold and other precious and semi-precious stones. While there, you will likely meet more experienced prospectors willing to share tips and techniques. There are also rivers on public lands where you can pan for gold, such as the Uwharrie River. The Uwharrie is a confirmed gold-bearing river right here in the Piedmont. I also suggest you visit YouTube and watch videos on the subject. Finally, words of wisdom. Even if you don’t find gold, you will have a great time on your adventure and come away with a new appreciation for Mother Nature and the great outdoors. Panning for gold is also great exercise.